It's been a little while since I have gotten a Julep Maven box. Either the products don't really interest me much, or a nail polish break is in order. For January, one of the offerings was a hydrating moisturizer that I just had to try. Dry skin is inevitable during the winter season so, anything that helps with hydration is a must for me. To my box I also added on a base coat which I was in dire need of, and a stunning glitter nail color that I couldn't leave behind. Sylvie: When it comes to glitter polishes, I tend to lean more towards the more neutral end of the spectrum. But when I saw the gorgeousness of Sylvie, the pink iridescent glitter just had to be mine. There is no doubt that Sylvie is going to make for a fun and fantastic accent nail color. Oxygen Bonding Base Coat: I was running low on base coat, so what better time to give this one a try? It's quick drying, helps polish last longer, and it also improves nail health. No Limits Luxe Hydrating Crème: This moisturizer helps treat and nourish dry skin thanks to a lovely combination of hydrating ingredients like Rosehip seed oil which soothes and repairs, and invigorating green coffee bean oil to help promote cell turnover. This crème can be used all over and it comes packaged in a lovely jar that contains a button dispenser that you push down, to get the product out. I think the dispenser design is genius since it helps keep the product fresh for longer. I am happy to report that I do find this crème pleasantly moisturizing. It leaves my skin super smooth, and it has a light scent that isn't overbearing. 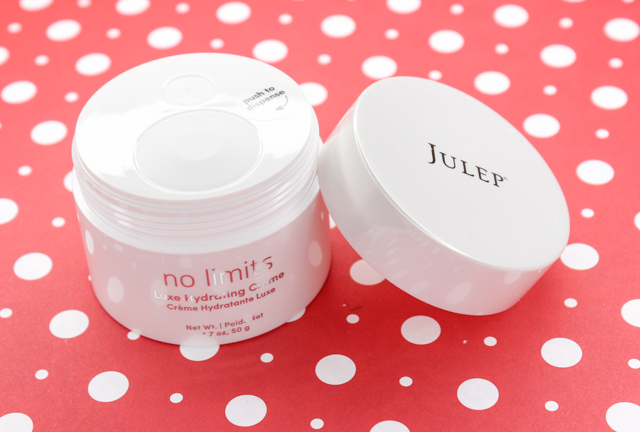 I am looking forward to using the No Limits Luxe Hydrating Crème all winter long. If you want to sign up for your own Julep Maven monthly subscription you can do so, here. What did you all receive in your January Julep Maven boxes?